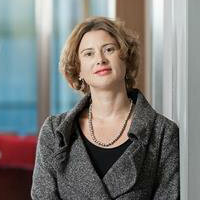 Dr Nicole Lux is a Senior Research Fellow and Project Director at the Faculty of Finance at Cass Business School. She was previously a Vice President at Deutsche Bank where she worked in loan restructuring and workout. Nicole started her career at MSCI constructing real estate indices and portfolio analysis. From there she joined Moody’s Investor Service as a rating analyst, where she developed new rating methodologies for CMBS, real estate and fixed income funds. Afterwards she worked in a number of investment and commercial banks such as Citigroup and Danske Bank in real estate loan origination. She was responsible for deal origination and execution for commercial mortgage loans of £20 – 500m across Europe. In 2016 Nicole took over the De Montfort Commercial Real Estate Lending project to increase transparency in commercial mortgage markets for regulators and investors. The project continues under Cass Business School under the Cass Commercial Real Estate Lending Report. Nicole has also published a practitioner’s book on modelling real estate risk and other research papers. She is regular conference speaker at CREFC, IPF, and MSCI and provides professional executive training through RICS, Euromoney, CREFC, Property Overview Ltd.
Lux, N. (2012). Assessing Real Estate Risk Applied Models, Concepts, Methods. ISBN 978-1-78137-078-0. Lux, N. and Moss, A. (2016). Liquidity in global real estate securities markets. Journal of Property Investment & Finance, 34(4), pp. 321–346. doi:10.1108/jpif-11-2015-0078 . Moss, A. and Lux, N. (2014). The impact of liquidity on the valuation of European real estate securities. Journal of European Real Estate Research, 7(2), pp. 139–157. doi:10.1108/jerer-12-2013-0026 . Lux, N. (2006). Sterling-Denominated European CNAV Money Market Funds: Key Features & Trends. London: Moody's Investor Service. Lux, N. MBS: European Red – Yellow – Green®: An Assessment of Office Property Markets, End-2005. Moody's Investor Service. Commercial Real Estate Lending Results Year-end 2017. (Conference) London (2018). Invited speaker.